On 22 September 2017, after a two day long sea operation, the first detection unit of the ORCA neutrino telescope came online. This marks an important milestone of the scientific and technological endeavour of the international KM3NeT Collaboration. Located in the Mediterranean Sea at a depth of 2437m and 40km offshore from Toulon, France, the ORCA telescope together with its sister telescope ARCA, located offshore from Sicily, will allow the scientists of KM3NeT to study the fundamental properties of the neutrino elementary particle and perform neutrino astronomy, mapping the high-energy cosmic neutrinos emanating from cataclysmic events in the Universe. Neutrinos are the most elusive of elementary particles and their detection requires the instrumentation of enormous volumes: the KM3NeT neutrino telescopes will occupy more than a cubic kilometre of seawater. KM3NeT comprises a network of several hundred vertical detection units – strings anchored to the seabed and kept taut by a submerged buoy. Each string hosts 18 light sensor modules equally spaced along its length. In the darkness of the abyss, the sensor modules register the faint flashes of Cherenkov light that signal the interaction of neutrinos with the seawater surrounding the telescope. During the sea operation, the ORCA detection unit, wound like a ball of wool around its spherical deployment frame, was carefully lowered from the boat to its designated position on the seafloor. 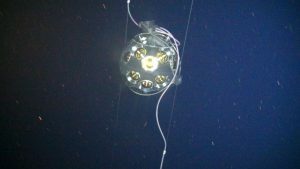 Using a remotely operated submersible, controlled from a second boat, the detection unit, still on its frame, was then connected to the junction box of the seafloor network already present on the seafloor. Once the electrical and optical connections to the shore station in La Seyne-sur-Mer were confirmed, the go ahead was given to trigger the unfurling of the detection unit to its full height. During this process, the deployment frame is released from its anchor and floats towards the surface while slowly rotating. 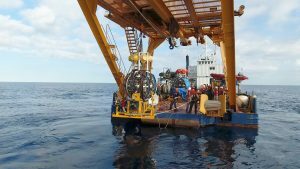 In doing so, the string unwinds, eventually leaving behind a vertical detection unit with a height of about 200 m kept vertical by the submerged buoy at the top. 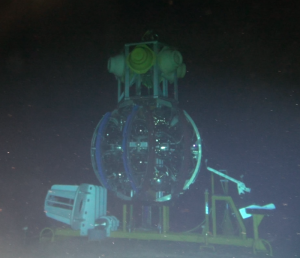 The unit was then powered on from the shore station and the data from the 558 light sensors inside its 18 sensor modules started streaming to shore. Almost immediately the trajectories of down-going muon particles, resulting from cosmic ray interactions above the detector, were reconstructed from the recorded light signals: the first detection unit of ORCA is online. Courtesy KM3NeT Collaboration and CNRS…..IFREMER….